Shipment Billing is part of our core system as it is considered an integral part of enterprise level logistics software. Freight bills can be entered manually, via EDI or automatically through our on-line shipping system. Data pulled directly from dispatch and/or driver communication devices will produce a skeleton bill which in most situations will produce enough detail to begin route planning and load manifesting before the freight has reached your facility. All the biller needs to do is verify the information against the original paperwork as the system will automatically code the bill-to information and apply the correct rates. An audit process will ensure that your customers pay the correct rate, including all accessorial and surcharges each and every time. Integrates in real-time with our financial package. 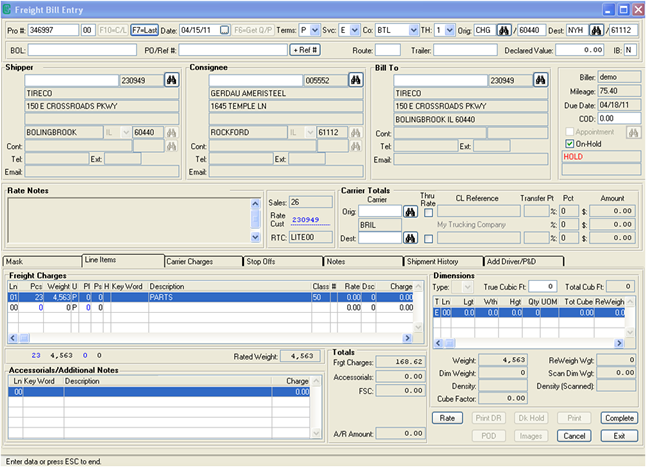 Billing information can be easily viewed from our tracing screen. Bills can be cut and orders dispatched at the same time. The system maintains invoicing preferences by customer. For each account, the program manages separate addresses for shipment, invoicing, statements and sales analysis. Billers can consolidate bills into a single freight bill with one freight charge. Customer specific billing instructions be called upon during data entry. Learn more about our Shipment Billing solutions & Enterprise Level Logistics software services by connecting with a CLI representative here, or send an email to sales@carrierlogistics.com.